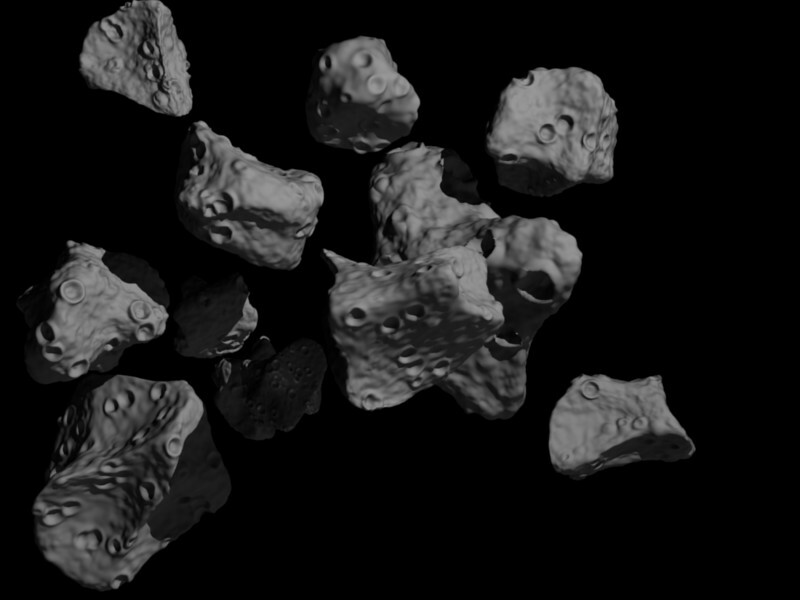 I found a great non-Blender tutorial for crafting asteroids. Anyone know how to do something similar in Blender? I’ve tried displacement mapping and hand sculpting. But displacement mapping (via a texture) looks terrible, and sculpting each rock would take forever. I’m looking to create 50 - 100 asteroids and it’d be wonderful if there was a fast way to do it. Well, here’s a technique to get you some more detail; I hope this brief explanation is not too cryptic. I have also zipped up a .blend for you to play with. If anyone is interested I could try and make a real tutorial for this. add two textures: „bump“ and „craters“. They will go into displacement modifiers later on, but we need a way to edit them for now. Scaling your asteroids UP in edit mode and then DOWN in object mode makes detail smaller and vice versa. For sharper edges you can add a simple-subdiv modifier (level 1) before the catmull-clark modifier. Today, please feel free to revel in your amazingness. I took the liberty of creating an expanded version of your steps in a tutorial. If you stumble upon anything that isn’t clear (or you think should be clarified), let me know so that I can improve it, eh? After using the vertex noise script, shrink/fatten is really helpful to make the shape even more interesting (instead of just scaling size). A few iterations of careful shrinking and fattening really gives interesting results (don’t overdo it or your faces start to intersect). To get a very different shape for every fasteroid (love the name! ), you should use a different seed value in the vertex noise script for every fasteroid (change it randomly, then tab ok a few times; no need to change inbetween). You don’t even need the script. Space>select>random 50% ok. Scale or rotate a bit, repeat. 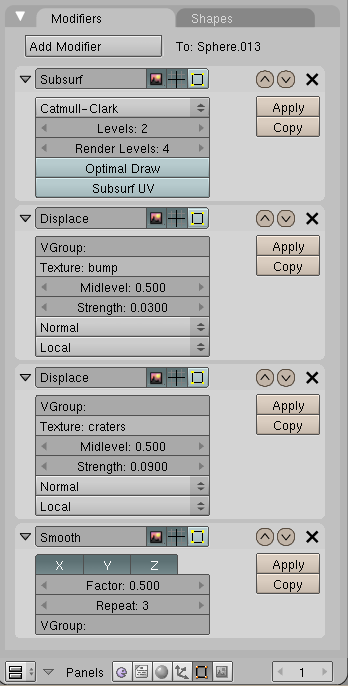 Thangalin, I found the part that dealt with material settings to be confusing. (Enabled, disabled, Value, Yellow?) Please clear that up or just provide screenshots of the material settings. I updated the material settings section. I don’t have time at the moment to capture the settings. I tried doing the Space >> Select >> Random (50%) to the mesh while in Edit mode. Nothing happened? the select>>random methods works fine, thanks LOTR Junkie! It’s even better than my approach because you don’t need two different template meshes, just the one with the material/modifiers (don’t know why I didn’t think of this… my slightly complicated method is due to the fact that the vertex noise script acts strangely on meshes with these modifiers). Note: You have to unselect all vertices before the selection step to make anything happen. @Thangalin: Maybe you should include this in the tutorial, it avoids the whole linking stuff.